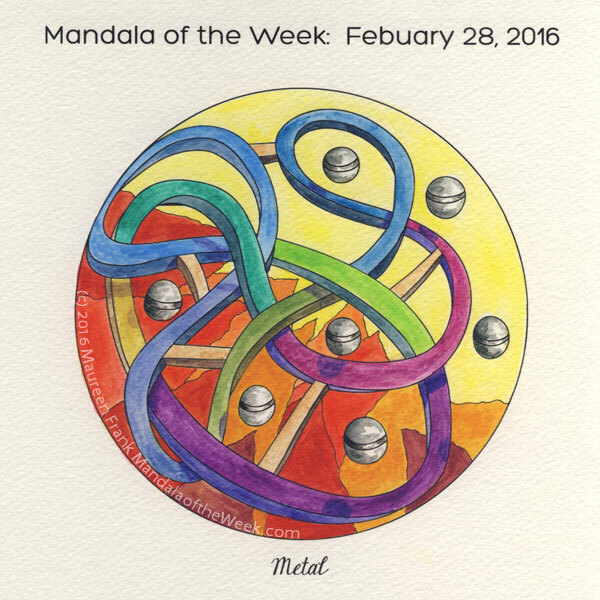 I present my coloring/painting of this week’s Mandala of the Week: Metal (from Sunday’s MotD post). I went in on this without any intentions except that prior to coloring it, in my minds eye, I saw flame-like designs behind the metal “roller coaster.” About half way through I realized that I wanted to use a good mix of colors including the ones I tend to stay away from using. As I look at it now, I see that with every twist and turn my life takes on different “colors” as I follow through on my what I’m wanting to create (flames) in my life. What holds it all together are my core beliefs and principles (beams). The “metal” balls remind me that I’m being guided and watched over along the way. What do you see? I’m happy to post my colorings however I would really love to share and showcase your colorings here as well. Feel free to send them to me. Or you can post them on my Mandala of the Day Facebook page.